Yesterday the OTN Yathra visited Bangalore. 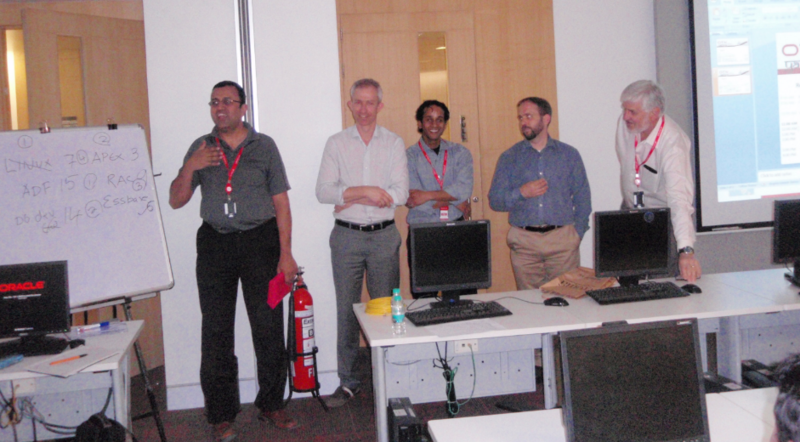 In the local Oracle office, two rooms were reserved for 14 technical sessions by Oracle ACE Directors, ACEs and other specialists from both India and the rest of the world. The agenda included sessions on Big Data, RAC, EssBase, LDAP (in the Oracle world), SQL, APEX, Database Application Development and Enterprise Performance. 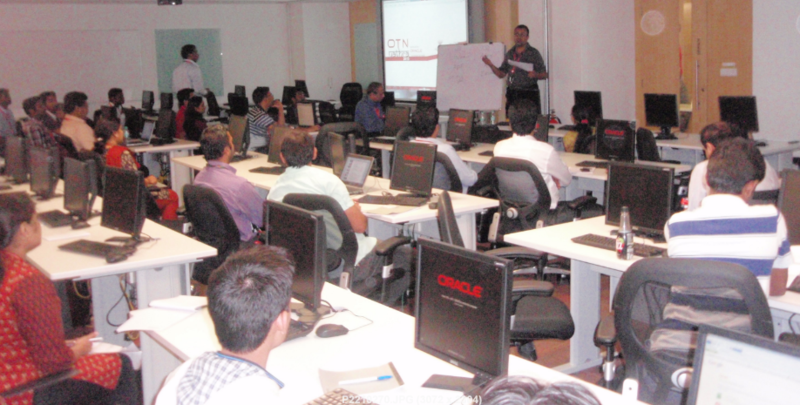 95 Delegates had signed up for this event and many Oracle employees drifted in and out of these sessions as well. This was the last venue that is visited by the five man band consisting of Edward Roske, Raj Mattamal, Murali Vallath, Hans Forbrich and myself. The last two cities will not have the pleasure of getting visited by Raj or Edward, so this was the perfect opportunity to say a big THANK YOU to the organizer of the tour: Murali Vallath. Murali put this tour together, soliciting speakers, creating the program, arranging the venues, doing the marketing, finding local volunteers to help put the events together and practical things such as arranging hotels and transportation and liaising with the taxi-drivers as well as staff at local venues. The four guys on the right in this picture are extremely grateful to Murali for making this OTN Yathra a big success and a great pleasure for all of us. The audience supported us in this by loudly and to Murali’s obvious discomfort (because he is way too modest) extensively applauding his efforts. Next Monday – 25th February – the tour will be in Hyderabad on the Oracle Campus. See here for the agenda. On Wednesday the final stage of the tour will be in Chennai, at the Anna University. Details can be found here.